What Muscles Does the Row Machine Work? What Kind of Exercise Can I Do to Lift My Breasts? What Muscles Does a Recumbent Bike Work? 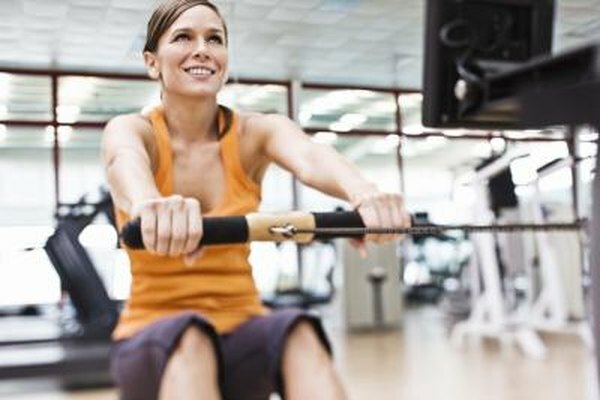 If you want to add definition to your back before tank-top season, a rowing machine can be your best friend. This apparatus features three grip possibilities that each target specific muscles. For example, rowing with a wide grip in which your palms are down and your elbows are away from your body focuses primarily on your trapezius. A narrow grip in which your palms face each other, or an underhand grip where your palms face up, make your latissimus dorsi the prime mover. Regardless of which grip you use, your back is sure to get a workout. The latissimus dorsi (lats) is the most powerful muscle in your back. It’s responsible for any pulling motions that bring your elbow down toward your body from the side, or bring it from in front of your body toward the back. Using the narrow or underhand grip on a row machine will focus most of the load on your lats. These muscles also help on the wide-grip row, but to a much lesser degree. The biceps brachii, brachialis (sometimes called the lower biceps) and brachioradialis muscles all work together to bend the elbow as your lats and traps pull backward on your upper arm bone, the humerus. All three row machine grips work these muscles. While the four small muscles of your rotator cuff are always working to stabilize your shoulder joint during any arm movement, the infraspinatus and teres minor, in particular, activate to assist with the pulling motion used on a row machine. Your rhomboids help pull your shoulder blades back and down, a critical factor in maintaining proper form throughout the row exercise. The natural tendency when using a row machine is to jerk back with the back muscles, using as much momentum as possible to make lifting the weight easy. Squeezing your abdominal muscles and the rectus abdominus, in particular, to press forward against the machine’s chest pad helps eliminate this bad habit, reducing your risk of injury and forcing your back muscles to work that much harder.